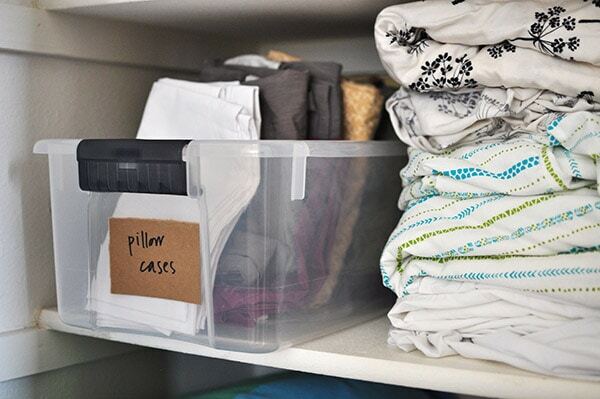 INSIDE : Have a messy Linen Closet? 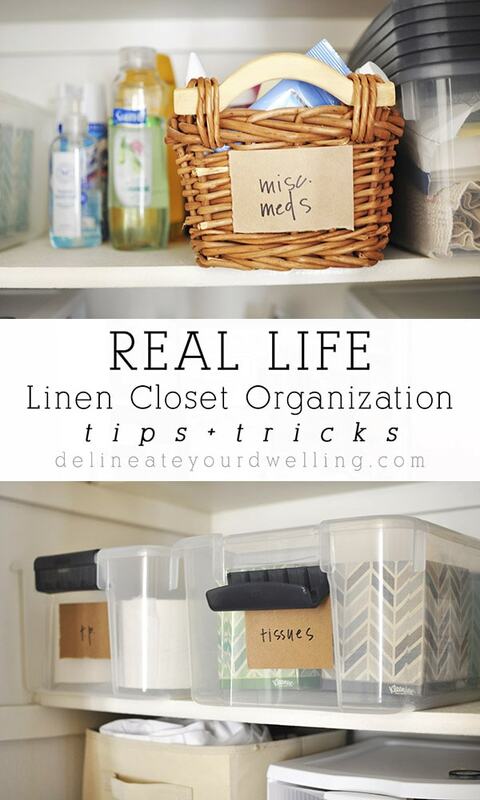 Check out these simple Linen Closet Organization Ideas that will help you sort through old items and store everything with better organizational systems in place! Today I am getting real real. 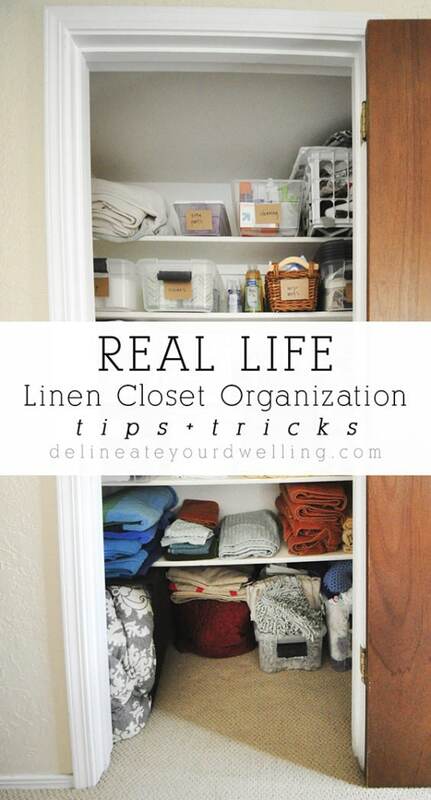 Today I am sharing Tips + Tricks to my REAL LIFE Linen Closet Organization. 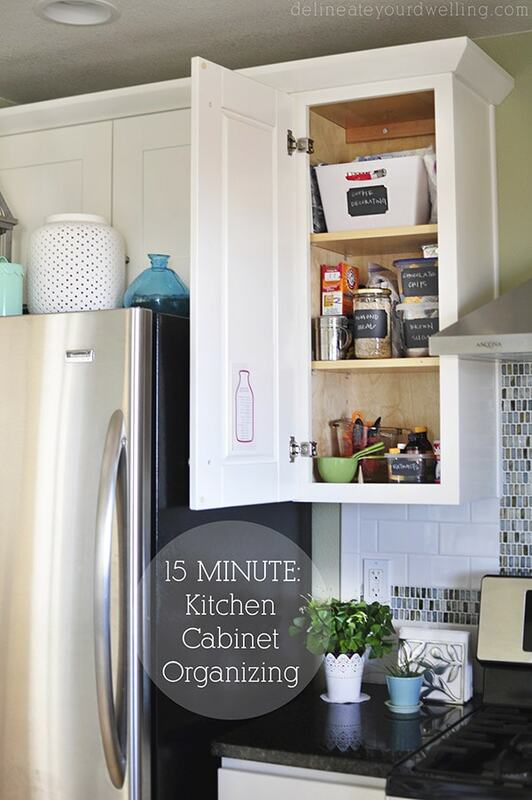 Unlike my 15 minute kitchen cabinet organizing and my where do things go in my kitchen posts, this one is upstairs and hidden away from nearly all guests. I am here today, to share that you don’t have to “Pinterest perfect” EVERYTHING in your life… although I do have some great Organizational Pins. Sometimes you just need some good ole’ fashion tips to make some sense of your linen closet. So let’s get started! -Wouldn’t it be fun if all my bath towels matched? -Wouldn’t it be amazing if all our medicines and cleaners were in clear glass bottles so you never saw ugly labels but only pretty colored liquids? -Wouldn’t it be grand if we had a walk in linen closet? 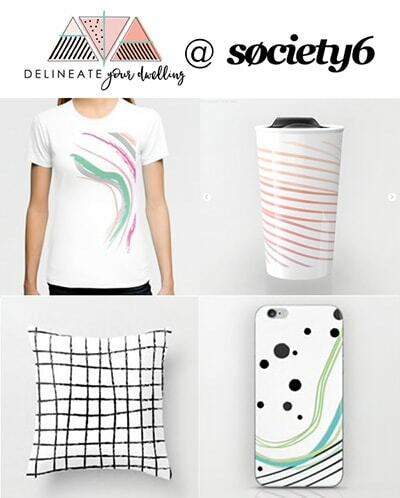 Are you saying yes to all of these, like me? Well guess what, sometimes the hopes and dreams to be organized and the reality of our homes and life just do not match up. And guess what else? That’s completely okay! Our linen closet is not a dream, it’s not super beautiful but it works really well for us. We all know exactly where things are when we need them and it is easy to see when I need to stock up on something. To tell you the truth… what more could you ask of a linen closet? When I decided it was time to take back the closet, it was a mess of blankets, 6 spare pillows, mis-matched bed sheets and every medicine you could think of jammed into that tiny space. The first and most important step is just dig in there and pull it all out so you can see what you are working with. (This was before Marie Kondo suggested we pile all our belongings into one big heap-ha! But does it Spark Joy? ) I guarantee you will be surprised at all that you have been keeping and not using. Now that everything is spread out all over your hallway and onto the floor, it is time to assess what you have and then PURGE! I made a pile of the random twin sheets we were keeping from my husband’s childhood. I freely admit, I’m not hugely sentimental, so maybe I was supposed to save them for the sake of memories. Maybe if I had a basement or an attic, I could have. Without a square inch of extra storage in this house, we have to live with only what we need and we do not need 1980’s twin bed sheets. I also noticed we had a huge amount of pillow cases that either didn’t match any sheets we currently owned or just were old and ragged. Purge time. If you’ve not used them in the last year, then you don’t need them anymore, that’s my motto! And I have no idea why we had a spare 6 pillows in our closet. A little excessive, I think. This tip goes along with tip two of purging. 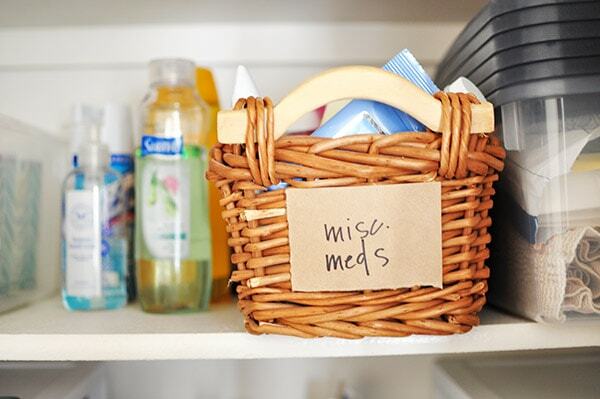 Since we don’t have medicine cabinets in any of our bathrooms, all our medicines, ointments and lotions live in our linen closet. Take the time to go through every single item in your medicine stash, I bet there is more outdated in their than you realize! Okay, so you’ve removed everything from the closet. You’ve purge mismatched sheets, old pillows and outdated medicine, you’re on a great path! Now it’s time to start a little organizing. I always start by grouping things in like categories. I started with medicine, ointments and lotions for adults and all medicines for the kids. Then, I made piles of pillow cases, sheets we actually use and sheets that are backups. Towels, wash clothes and any other bathroom related towel go in a pile. I have an assorted pile full of old shower curtains that I might use again some day. Blankets, quilts, etc… all in a pile. When you look around and see 80 piles in all these different categories do not be overwhelmed! You’ve done the hard part, way to go! Now it’s time to contain all these piles. This is a HUGE tip. I used to simply stop at the piles and nicely stack my piles back in the closet. Not even a week would go by and the hubs would grab a bath towel then the kids would dig around for band-aides and suddenly all that hard work was gone. I’ve seen learned that containing group items makes all the different in the world! Also, I use clear plastic bins for items we go thought a lot of, namely toilet paper and tissues. I can easily open the door and see how many we have left. It makes shopping for those types of items so much easier! Tip Six : Label, label, label! 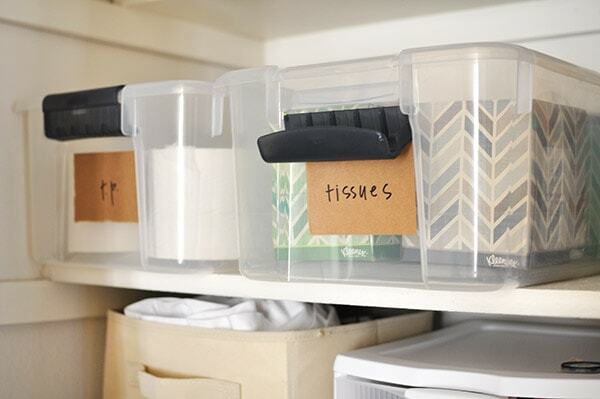 The last tip is so helpful for the rest of your family to keep things organized for the long term. Your labels can be as fancy or easy as you would like. I went the easy route simply writing my labels on brown craft paper. Keeping it real, remember. Once you are done, you can step back and look at your real life masterpiece! It may not be stunning but things should now be organized and should stay that way with little effort. I’ve had my linen closet like this for about six months and it still looks just as tidy as it did when I took these pictures! Fun tips and hints! Very helpful! Thank you so much for sharing with us! No problem, Rebecca! Thanks for stopping by. I have a harder time with the bathroom-ey stuff than the kitchen stuff. I have so many different sized bottles and boxes of stuff. I like the idea of a clear container for the tp so you can see when you need more. 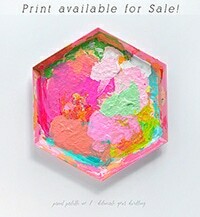 Hello from Treasure Box Tuesday – sending you Like love! My linen closet is super tiny and seems to be the black hole of our home. We just throw things in there. I love your tips and they have encouraged me to start from scratch and get things easily organized. Clear bins are now on my shopping list! Yay for clear bins! It’s so simple but they really have changed my entire closet strategy, haha! Good luck, Aliza. Thanks, so many great ideas! I seriously need to put these tips in place. My closets are a mess. Each and every single one! My problem is TOO MANY CLOSETS! Isn’t that a terrible problem. Leads to lots of stowing and it gets overwhelming. So need to do a few closet purges! Great tips! I like what you did here – I’ve been emptying out my cupboards but never thought of storing pillow cases in plastic. Like that for all my sheets. It’s amazing what a difference used clear storage for everything has done. Everything is easy to see and keep tidy now! I agree, it’s hard to just start sometimes but once you do… it slowly starts taking shape! In the end, you’re always so happy you started! These are great tips! I especially like the idea of using clear containers in order to see what’s inside. I’ve just started using clear containers with toy storage and it’s fabulous. It’s amazing how the little things (like clear containers) can really make a huge difference! These are such great tips! 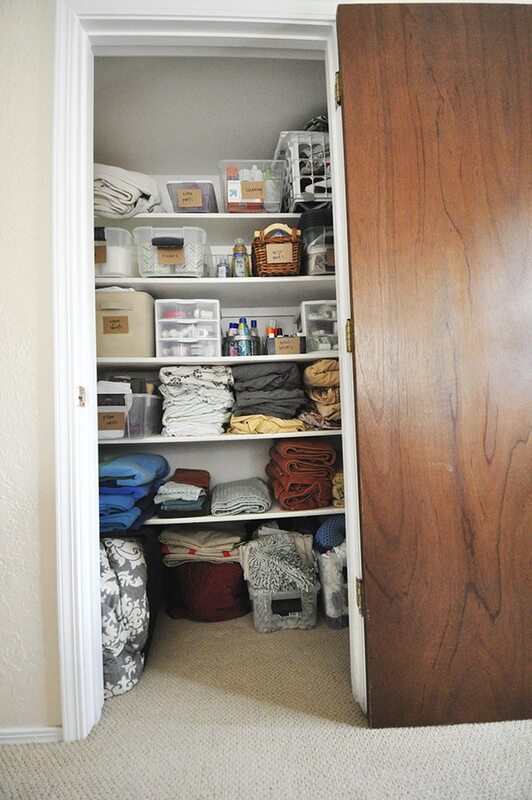 I only wish I had a linen closet… we don’t really have any closets at all in our house. Just one in a random bedroom where I keep all my craft supplies. Even our master doesn’t have a proper closet. So strange!